Hewlett-Packard, a leading technology provider with a global footprint, saw an opportunity to significantly improve its digital marketing efforts by creating a universal framework for user-level data collection and usage. 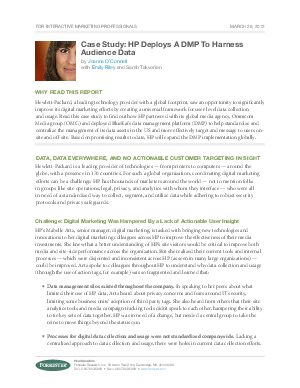 Read this case study to find out how HP partnered with its global media agency, Omnicom Media group (OMG) and deployed BlueKai's data management platform (DMP) to help standardize and centralize the management of its data assets in the US and more effectively target and message to users on-site and off-site. Based on promising results to date, HP will expand the DMP implementation globally.